It was found in 2008 at Karakalpak State University. Nowadays the faculty is headed by O. Duysenbaev, candidate of philological sciences. 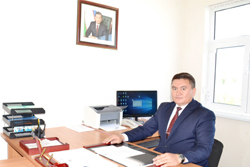 There are three departments preparing specialist in the faculty of Uzbek philology: department of the Uzbek linguistics (the head of the department is I. Kazakov), department of the Uzbek language and literature (the head of the department is I. Kurbanbaev) and department of Philology ( the head of the department is J. Sharipova). Ch. Choriev, who is the deputy dean for Academic Affairs, and G’. Orazbaev, who is the deputy dean for Youth Affairs, are operating at the Faculty of Uzbek Philology. Totally at the moment there are 555 students study in these fields.